Ingredients: 4 cups Rice, 1 cup Urad Daal, 1 tea spoon Fenugreek seeds (Methi), 1 Table spoon Semolina (Rava), Salt to taste and Oil or Ghee for frying. Method: Separately soak Rice and Urad Daal. Soak Methi with Rice for 4 to 5 hours. Grind the soaked ingredients adding Semolina while grinding to thin paste. Add Salt with water to make batter and keep aside for 6 to 7 hours. Heat pan or griddle with a little oil or Ghee. 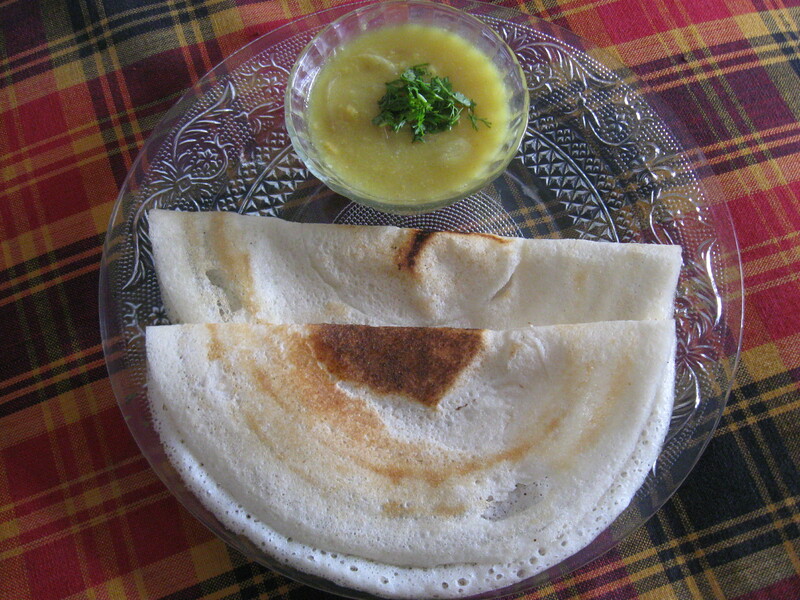 Spread the batter on pan in circular motions to make thin dosa. Cover with a lid for half a minute. Add about ½ a tea spoon of oil or ghee on the dosa. Fry till golden brown and remove from pan. Serve hot. Method: Fry green chillies for a minute and then grind all the above ingredients adding water as necessary to a paste. Chutney is ready to eat with Dosa. Ingredients: 2 Onions, 3-4 Green chillies, 3 table spoons of Besan, ½ tea spoon Turmeric powder, Salt to taste, 1 table spoon Oil, Water, Coriander leaves for garnishing. Method: Cut the onions and chillies in thin slices, Heat oil in a deep pan, add sliced onions and fry till golden brown. Meanwhile add green chillies and turmeric powder. Add 2-3 cups of water and make it to boil. When the water starts bubbling, add besan and stir continuously to avoid lumps. Simmer on low flame for 3-4 minutes, add salt. Garnish with chopped Coriander leaves. And serve hot with dosa.